The Pixi Beauty Skin Mist Collection has something for every occasion. If something claims it will make my skin look dewy, hydrated or glowy I will try it! I prefer my skin to be dewy and hydrated. If you’re over 27 you’ll probably understand why! I have dry skin so keep that in mind as I don’t really have to worry about if a product makes me oily. My skin is like the sahara! If you are anything like me keep reading to find out why you might enjoy one of (or all) 4 Pixi Mists. 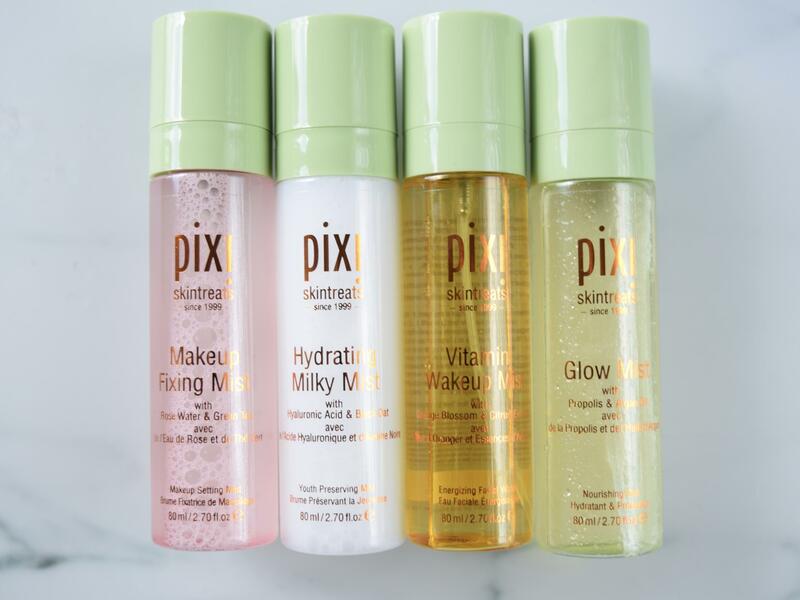 All four Pixi Mists can be found at select www.pixibeauty.co.uk and on ASOS or in their store in London. They retail for £16.00 – £18.00 and there are 4 to choose from. Some can also be used together to create the perfect #multimisting experience. This makeup fixing mist is for use after your makeup has been applied. It sets your makeup to prolong its wear and keep it from smudging. It also helps to stop your makeup sweating off in hot weather or settling into fine lines in cold weather. The mist contains rose water and green tea to hydrate the skin. This mist works on the same principle as the Mac fix plus spray which I do like but the spray on this Pixi mist is finer. Just like fix plus you can use it to set your makeup, hydrate and refresh your skin. You can even spray it on your brushes to intensify eyeshadows. This is one of my favourite facial mists as my skin always needs extra moisturiser. I think this will be great in the summer and on holidays to hydrate the skin when it’s dry from the sun. This facial spray is a boosting facial toner which is to the face what red bull is to your body! I spray this after using my Clinique Vitamin C fresh pressed cleanser in the mornings and it gives a revitalised awakened effect to your complexion. As well as citrus extracts it contains orange blossom water lavender, and arginine to cool, refresh and give the skin that wake up zing! The Glow mist is amazing for getting that glowing luminous and smooth complexion. It’s an oil-in-water formula enriched with 13 natural oils plus propolis, aloe vera and fruit extracts. 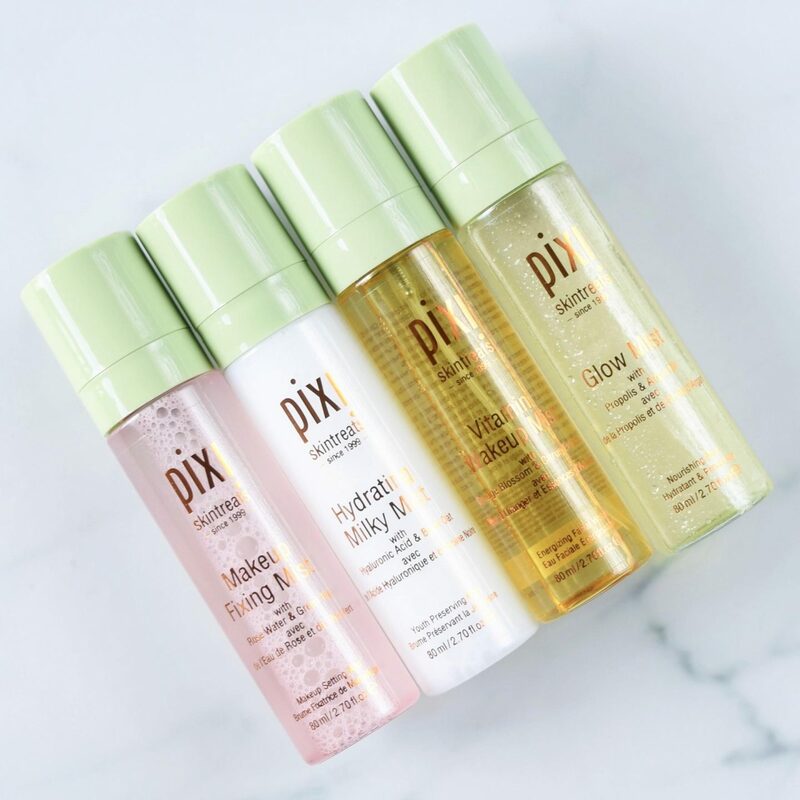 Use this as a hydrator, to give a finished makeup look that dewy look or to refresh makeup after a long day before you go out in the evening.Glow mist is overall my must have from the Pixi Beauty Skin Mist Collection. This gives you a perfect dewy glow and I love it. Since they are all quite different and you may not want to splash out on four, here are my tips on which one might suit you best. I would love to know which ones you are thinking about picking up! Products sent for review. I already got all but the vitamin wake up mists purchased by myself.